A member of the parsley family but grown for its roots. 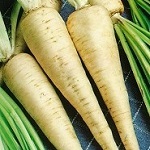 These can be roasted like parsnips and taste delicious. Can also be grated raw in salads. The young leaves can be used like parsley and taste superb combined with the roots. Sow directly into growing site in March.